Wader Quest: New Australian Wader Study Group tracking project. New Australian Wader Study Group tracking project. Australian Wader Study Group (AWSG) Eurasian Whimbrel and Grey-tailed Tattler satellite transmitter projects 2017. 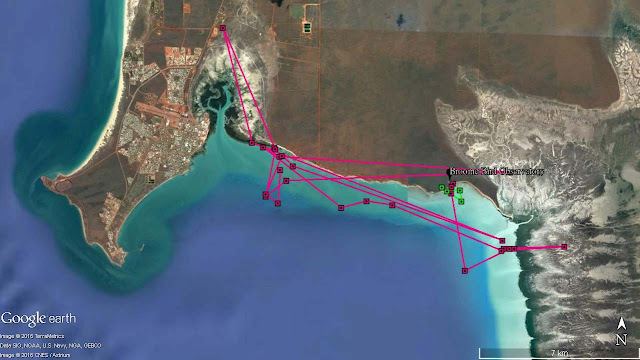 AWSG has been experimenting with the use of satellite transmitters for tracking the migration of shorebirds visiting North West Australia since November 2013 when five 5g satellite transmitters were deployed on Little Curlew in Roebuck Bay, Broome. A further three transmitters were put onto Little Curlew at 80 Mile Beach in February 2015. The target species was then switched to Grey Plover in February 2016, with five units again being deployed at Broome. Some extremely useful new data has been generated on the migrations of both species, although the results have been mixed, with many transmitters ceasing to function when a bird was part way through migration. 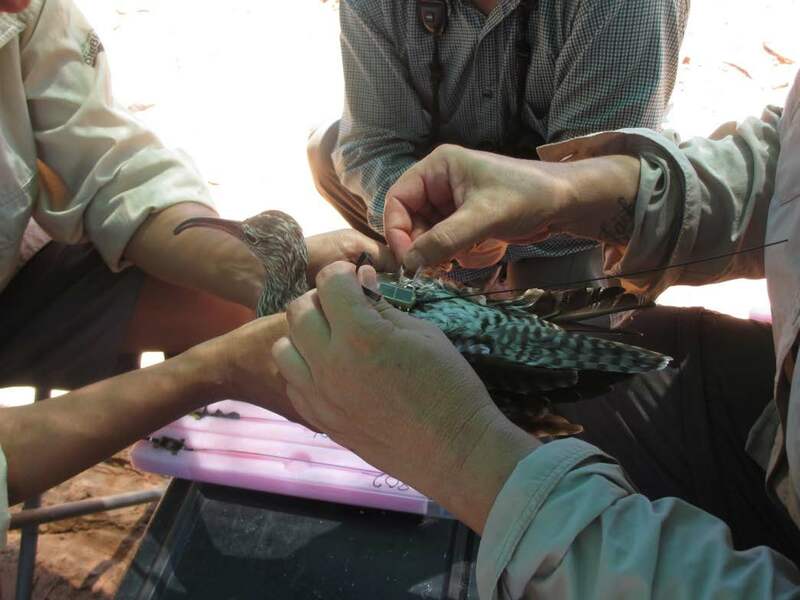 It was decided to extend the satellite transmitter program to Whimbrel in 2017, with five 5g units being deployed at both 80 Mile Beach (one bird) and at Broome (four birds). 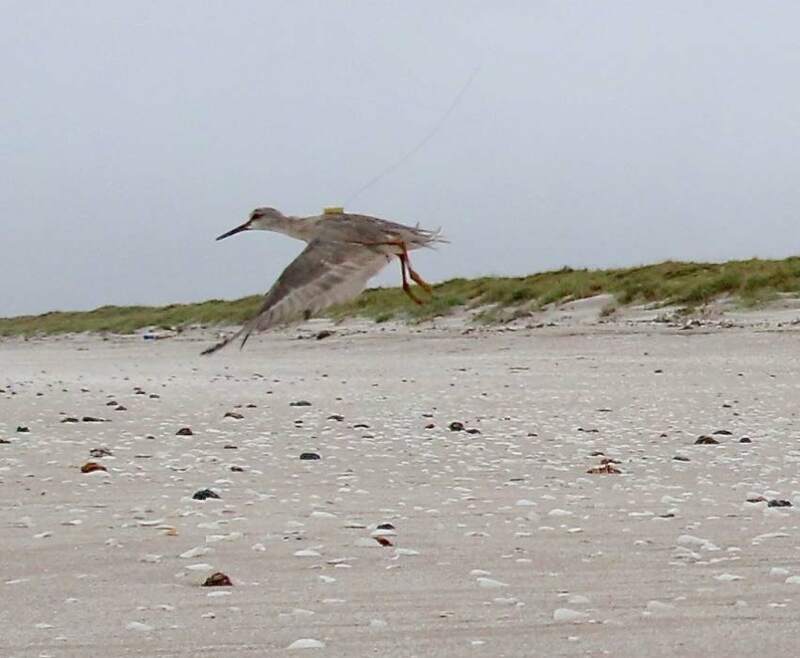 In addition, recently released 2g transmitters, developed by Microwave Telemetry Inc. (MTI), were deployed on five Grey-tailed Tattler at 80 Mile Beach. This was carried out during the NWA 2017 Expedition, in February 2017. It is exiting to track birds with satellite transmitters because up-to-date location data is received as the bird flies or rests after migration. This occurs either in real time or at a maximum of two days behind the recorded event. Unfortunately it has the disadvantage that technical or other failures (revealed extremely promptly) are often with no direct evidence on the cause of the cessation of transmissions being apparent. Such is already the situation for our satellite transmitters in 2017. Four of the five Whimbrel with 5g transmitters is still giving regular signals from the area where the birds were originally caught. Only one has disappeared, either because it was predated or because of a technical failure of the equipment. However all five of the satellite transmitters deployed on Grey-tailed Tattler have already ceased sending transmissions! This is a disastrous outcome for an outlay of $25,000 on these new super light-weight (2g) units. These units differ in a number of ways from the 5g units. In particular, the aerial doubles-up as the harness system to attach the transmitter to the bird via wing-loops and a neck-loop. The harnesses superficially appear very light-weight and potentially vulnerable to damage. The fact that this is probably the cause of the premature failures is supported by the fact that one of the Tattlers was sighted and photographed in the field at 80 Mile Beach on 7-8 April still carrying its transmitter but with a part of the harness damaged and all of the aerial missing. Such are the problems with working at the frontier of science with newly developed technology! We will be consulting with MTI on this apparent harness problem with their 2g units. Hopefully improvements can be made in the future which will enable this otherwise excellent step-forward in technology to be fully utilized. A more detailed description of activities so far this year on these two wader satellite projects is given below. We will continue to circulate information, as in previous years, at regular intervals during the migration, hoping that we can record in detail the migration of Whimbrels to their breeding ground in Siberia. 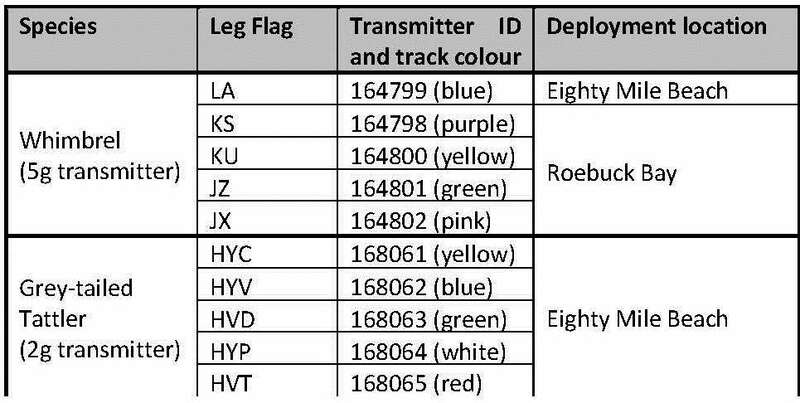 The transmitter numbers and their engraved flags are shown in the following Table. The locations and tracks shown in the maps below are a “representation” of where the birds are. These locations consist of signals with various degree of accuracy and were not filtered or analysed yet. The first bird to receive the transmitter was LA the Whimbrel on 12 February at Eighty Mile Beach. 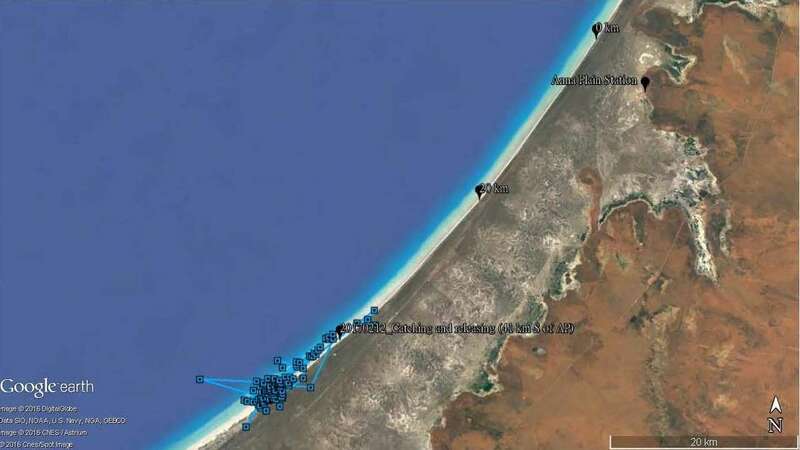 Since the deployment of the transmitter, LA has spent all time at the section of the beach from 40km to 50km south of the Anna Plain Station entrance at Eighty Mile Beach, near the area where it was captured and released. LA is a 2nd year bird (born in 2015 breeding season) so it will be interesting to see if it will migrate north this year. Whimbrel KS and KU were captured on 24 February at West Quarry at Roebuck Bay. Unlike LA, these two birds have not spent much time around the catching site since they have been fitted with satellite transmitters. Most of the time they were at Dampier Creek at the western end of Roebuck Bay and occassionally visit Crab Creek and the salt marsh in the east or even beaches in Broome town at the west. Both KS and KU are mature bird (born in or before 2014 breeding season) and are expected to start migrating north in a few weeks’ time. 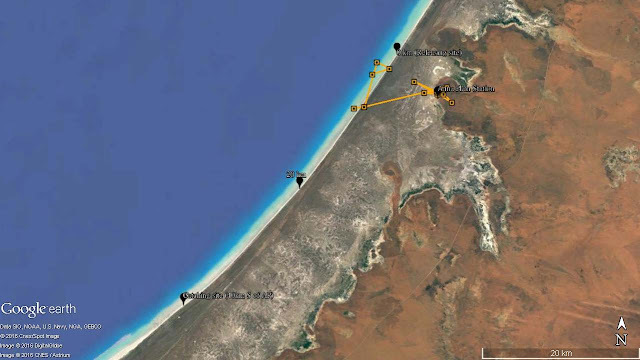 Later on at the end of March, the local team in Broome set up mist nets for two consecutive nights at the salt marsh just north and east of the Broome Bird Observatory and successfully capture JX on 25 March and JZ on 26 March with the last two 5g transmitters deployed. 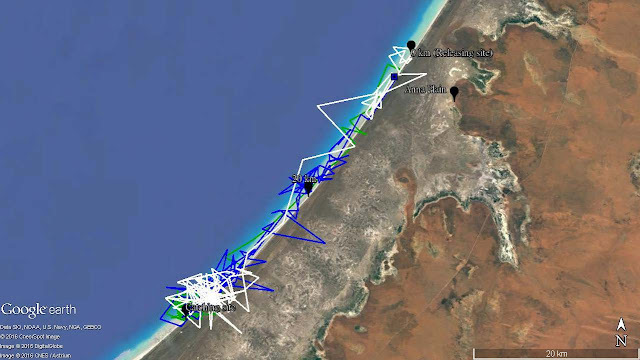 Unfortunately, the transmission from JZ stopped a day after the deployment which could be a transmitter failure or due to the predation in Roebuck Bay. Similar to KS and KU, JX more often spent time at the western end of the Bay near Dampier Creek and occassionally visit Crab Creek and the salt marsh in the east. Catching and deployment of all the 2g transmitters were carried out at Eighty Mile Beach. All five birds were captured at the section of beach 40km south of the Anna Plain Station entrance of the beach and released the day after at the Anna Plain entrance (0km). HYC, HYV, HVD and HYP were released on 14 February. HYC lingered at the release site for three days and then signals indicated the bird flew inland, which was unusual for a Tattler. The transmitter once stopped working on 25 February but then come back to send lower quality signals on 7 March until today. It is looking likely that the bird might be predated and the transmitter carried to an inland location by the predator, where the transmitter still occasionally receive solar energy for transmitting. Since then, it looked like HYV, HVD and HYP moved southward along the beach as a group. Seven days after they were released, they were back to where they were first caught at 40 km south of the Anna Plain Station entrance. 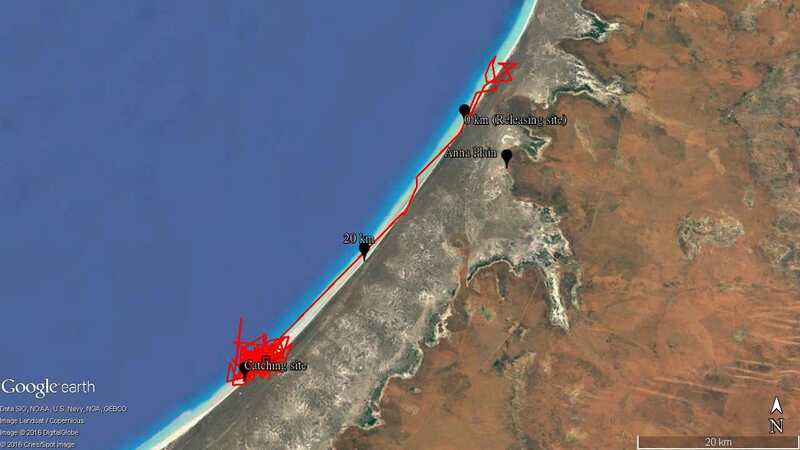 HYV stayed at 40km until mid-March and then moved to the beach section between 15km and 20km in late March. Unfortunately, we’ve lost signal from HVD on 11 March, HYP on 9 March and HVD on 21 March. HVD was sighted on 7-8 April, still carrying its transmitter but with a part of the harness damaged and all of the aerial missing. Captured and released a day later, the fifth Tattler HVT behaved a bit different to the others. Upon releasing on 15 February, it first spent three days north of the 0km Anna Plain Station entrance, and then spent 3 days moving southward to where it was first caught at 40 km. HVT has been staying around that area since then until the last signal receive on 30 March. 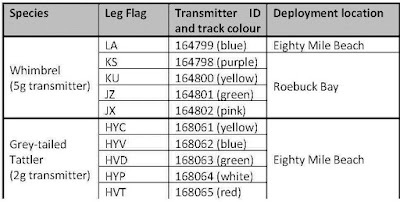 Regardless of the early failure of these transmitters on the Tattlers, it is still very interesting to see the high site fidelity of these individuals to certain section of 80 Mile Beach. The AWSG would like to thanks Doris Graham for her generous donation to cover the purchase cost of five 5 gram satellite transmitters for Whimbrel. These projects would not have been possible without the fieldwork efforts of the AWSG NWA2017 Expedition members and the local Broome volunteer (Adrian Boyle, Grace Maglio, Kerry Hadley, Chris Hassell, Jon Hall, Franky O’Connor and Jason Richardson).